I know this is a cycling blog, but since most cyclists are also Hummer aficionados, I thought you may be interested in this sneak peak from General Motors. It’s comforting in these times of need to see how the automobile companies will be using the bailout money. Wait no longer. General Motors has listened to Hummer owners requests, and has built the biggest, deadliest, most fearsome Hummer yet. Introducing the all new 2010 Hummer H4, a joint effort of General Motors and Lockheed-Martin. Instantly militarize any peaceful gathering. Let people at the supermarket know you mean business by taking up a FULL TWO parking spaces. 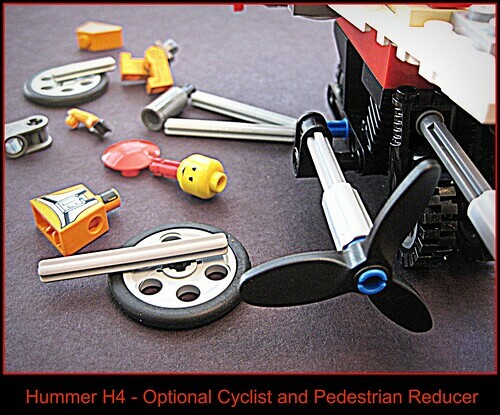 Mow down spandex wearing sissies with the optional stainless steel Cyclist and Pedestrian Reducer. Share THIS, buddy! What if I don’t want to share the road? The Hummer H4 cockpit is more tank than car. There are no windows to allow annoying socializing with fellow citizens. All visual input to the driver is provided by a 5 camera system, fed to a 52 inch plasma flat screen TV. Experience the REALISM of your drive with a 7.1 surround sound system including a 700 watt sub woofer. Missed most of your commute because you were playing X-Box? Play back 6 hours of driving footage on the 500 Gigabyte Digital Video Recorder! 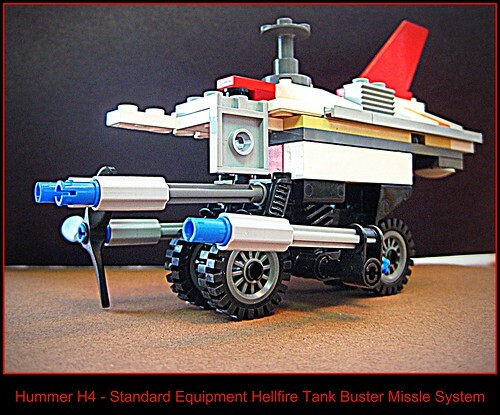 Teach those puny hybrid Prius drivers an Inconvenient Truth with the standard equipment Hellfire Tank Buster Missile System. 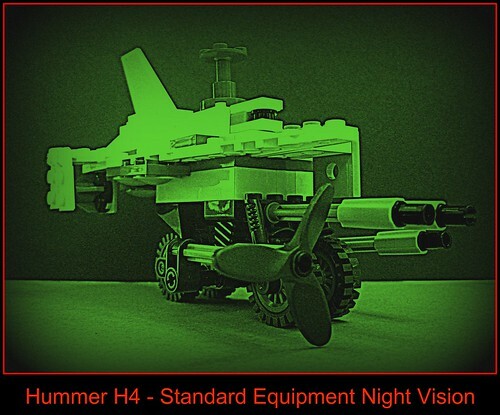 And thanks to standard night vision cameras, the carnage doesn’t need to cease when the sun goes down. Slay all those who oppose you at night when they least expect it. Tow 15,000 lbs with the standard 9.0 liter turbo diesel engine with propane injection, or upgrade to the deluxe towing package: a 3,000 horsepower, 2 stroke diesel locomotive engine, with a mechanically assisted turbo charger powered by a 6.2-liter V8 Corvette engine. Two engines, two kinds of fuel. Thank goodness you have enough torque to tow a tanker truck behind you! Be the first in line to test drive the H4 when it arrives in April, and start building your RV garage now! That is sick. I want mine in the Apocalypse Metallic Grey with the bloodstripes down the sides. I wish we had manly legos. All of our Emily’s legos are domestic and come with flowers and crap like that. Looking at the fuel specifics: Sweet and Sour fuel exhaust, my favorite. Be sure to have your feet on the pegs, and have the brakes set when you shoot off the Hellfires. I like the way you expirience Realism, 52″ at a time, on a flatscreen. Once all the bailouts are done, these dealerships will pop up all over the south side of town. Yum, yum, Can I have one? Does that come with an automatic “Rubber Ball Projectile”? That option might come in handy. i need one of them propeller things on my bike commute home i think. and a rubber ball projector too. that’s kinda cool. i think it’s known as “government motors” now though.